Known as the latest and greatest Explorer II model, the 42mm is an all-around remarkable timepiece with many of the original Rolex touches, such as the white dial with black trim and black engraved 24-hour bezel. One of the most popular, larger sized Rolexes watches, this watch feels like it’s meant to be on your wrist. Two-toned, 18k yellow gold and stainless steel make this Rolex not only a classic but also one of the most iconic. The 1990s, Two-Toned Submariner is a watch people automatically associate with Rolex. During Becker’s financial planning days, one of his bosses wore this watch and left a long-lasting impression on him; the Submariner represents success. And since the relationship with a Rolex is sometimes love and sometimes lust (hence our BeckerTime Lifetime Tradeup Guarantee), Becker has a few favorite Rolex watches for the moment. Only time will tell if these turn into long-lasting love affairs. It’s hard to capture the true beauty of the turquoise dial, but when picking a Rolex dial, turquoise is easily one of the best color options. It’s eye-catching but conservative and classic. Sought after by many watch collectors, this vintage, custom 1960s Datejust model features a stainless steel jubilee bracelet. It’s a watch people will stop to admire! Both the black dial with white illuminating markers and black ceramic 24-hour bezel are a few reasons why the GMT Master II is one of Becker’s current favorites, as well as one of the hottest Rolex watches on the market. This watch also features a stainless steel oyster band with a Rolex signed clasp, which is a newer, heavier style SEL band. While not a Rolex, this limited-edition Romaine Jerome Liberty DNA watch can’t be overlooked. Due to the unique blue-green color and bronze bezel, the DNA is a tribute to Lady Liberty. With only 125 available for purchase, the DNA contains many original Romain Jerome touches. We believe it’s simply a must-have collector’s item. What are your favorite models at BeckerTime.com? Let us know in the comments below or join the conversation on Facebook at www.facebook.com/BeckerTime/. 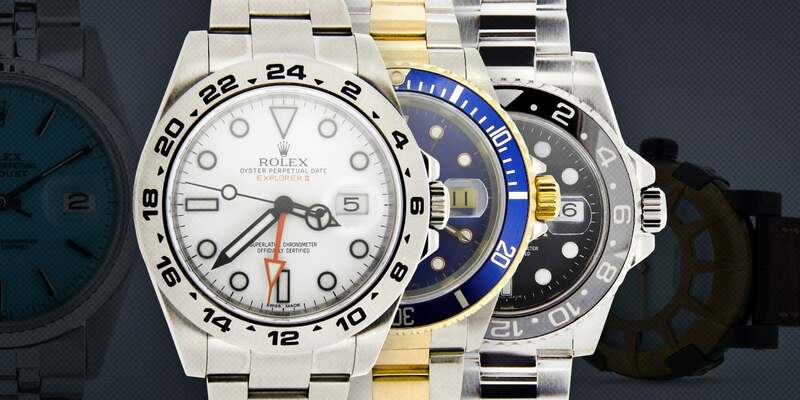 If you’re looking for a pre-loved, preowned Rolex, you’ve come to the right place. You can view an extensive collection of incredible preowned timepieces here at BeckerTime.